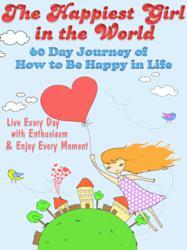 Author Julie Schoen is gearing up to release her latest book in collaboration with Little Pearl Publishing, The Happiest Girl In The World: 60 Day Journey of How to Be Happy in Life. Her journey, which has lead her to become the “happiest girl in the world”, is now detailed in her new book, which will be free this week on Amazon. Her journey, which has lead her to become the “happiest girl in the world”, is now detailed in her new book, which will be free this week on Amazon. As Lincoln enthusiasts everywhere flock to theaters this holiday season for the Spielberg – Daniel-Day Lewis collaboration, one Honest Abe fan is gearing up to release her latest book in collaboration with Little Pearl Publishing, The Happiest Girl In The World: 60 Day Journey of How to Be Happy in Life. Suffering from depression and a “naysayer” attitude for several years, author Julie Schoen went on a search to find the source of ultimate happiness. The results of her journey, which has lead her to become the “happiest girl in the world”, are now detailed in her new book, which will be free this weekend on Amazon. The highlight of Schoen’s new book is the 60-day journey she takes the reader on filled with her personal affirmations and favorite happiness quotes. The idea of this journey lies in her meditation and yoga training that teaches students how to be present. Schoen’s inspirational writing helps to drive home the importance of life and where the source of happiness really lies – within us. “I wasted so many years of my life never being present. I was so busy being worried and angry, holding on to grudges and sadness, that I never stopped to look around and see all of the beauty that was around me, all of the beauty that was in me,” explains the author. The pages in The Happiest Girl in The World are filled with humor, honesty, and the wisdom from someone who has experienced the extremes of inconsolable sadness and extraordinary happiness. An absolute joy to read, this uplifting book takes you on an enlightening journey to find your ultimate happy. The Happiest Girl in The World by Julie Schoen will be free on Amazon from December 1st – December 5th.